More work work... Quick update and starting the real Jump Pack mountain of work. Check out today's after the jump. I keep finding awesome inspiration, and wanting to run home to work on my dudes. For those of you who dig Dakka Dakka, you may have seen Eggroll's work here. Again, lots of airbrush, and bold use of lights and darks. I keep seeing and learning as I continue to paint that highlighting and striking shading is not for the faint of heart. If your highlighting and shading looks to bright, it's probably just right. i kept looking back at my jump pack glow and worrying, but after I slept on it, and trimmed in the black on a few packs and cleaned up my reds, I think it looks just right. With renewed confidence and inspiration from other's work I sat down a plan for the week. Get something done: Painted up a handful of base coats on my Packs. First, I mixed up a batch of my Blue Black with 80/20 mix of black and regal blue for all of my packs, and ASM to ensure that they all stay consistent. And like I mentioned I wanted to prepare some work for next week. 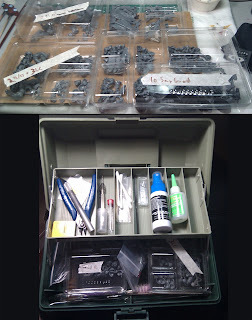 I will be on the road Monday through Wednesday of next week and I clipped out and organized my 10 ASM, 5 TH/SS/LC Termies, and all of my multi-weapons/Sgt arms. 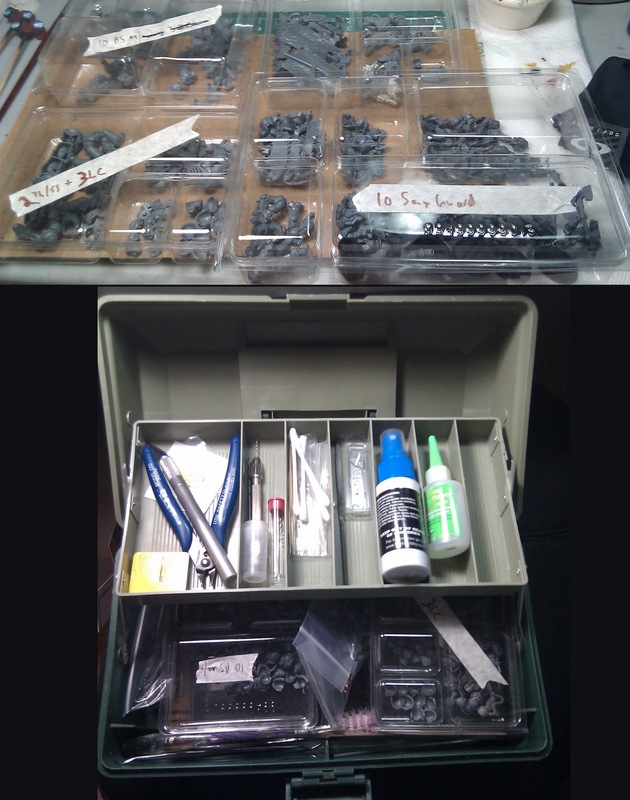 I will use those days to trim, file, drill, assemble, and ready these models for painting to keep myself productive 3 days in a hotel. All packed conveniently in one tackle box. All the tools of the trade. 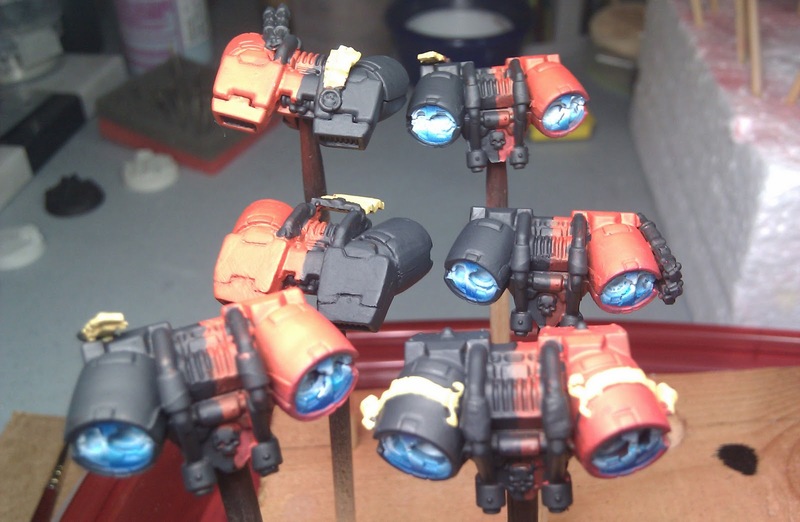 And finally last night, I did get half a dozen Jump Packs lined in black, base coated and cleaned up in my red. Not too bad for a Monday. Back to work!